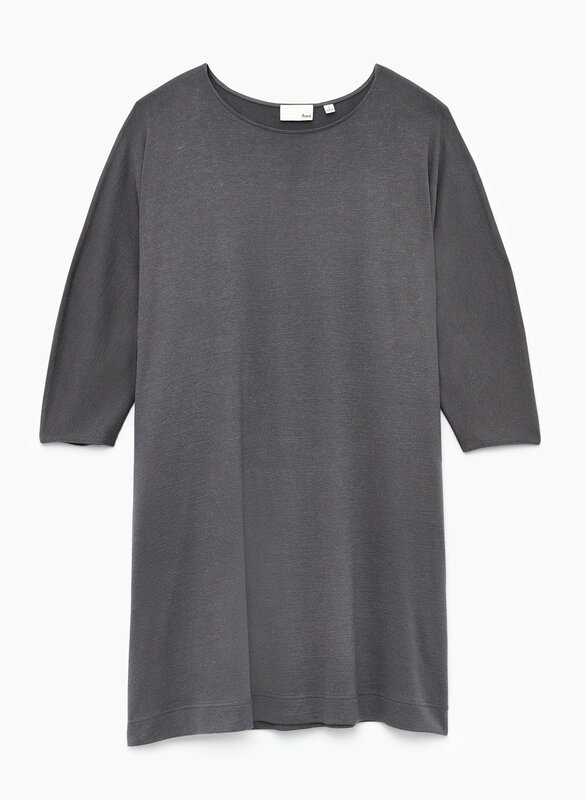 This t-shirt dress is the epitome of comfort. It's made with Wilfred Free’s signature fabric, Reposa™ — a luxe jersey knit that hangs beautifully and skims the body in a flattering way. I love this dress, I have it in every colour. Easy to wear, just wash and go. Easy to dress up or down, I wear it with leggings or tie it off to the side with jeans or pencil skirt. This dressed looked like it would be a nice flowy option. But despite the great fabric and movement, the shape ruins the dress. It makes my hips look about three times wider than they actually are and throws of my natural proportioning. I bought it on sale and didn't want to pay to return it. This will be a dress to wear around the house and play with the dog in. Bought it in grey first during first pregnancy trimester and then bought it in black too because it's perfect - so comfortable; easy to wear to work or on weekends; i've worn it with a vest over top, boots, sneakers, heels and the kahlo jacket - it's a staple if you're expecting! best part is, it's simple enough that i can wear it post-baby too. i'm usually a med/large depending on the fit ( i don't like super tight clothes anyways) but the medium is perfect - room to grow forsure. if i wasn't expecting, i probably would have gone down to a small. Fits true to size. Comfortable. The fabric is soft and flowy. So glad I purchased this ! I like the pockets and the soft material. I haven’t washed yet so I hope it holds up. It fits a bit big. Great dress for work. Comfy and easy to dress up and down! It’s comfortable and easy to dress up and down depending on the occasion. I really like it especially how it has pockets! But where the pockets are, it kinda makes your hips look wider. Also, with the fabric, although it’s flowy, it can be easier to see your body’s “flaws”. This can be worked on though. I got it in black and it’s super cute with a short blazer or Jean jacket so far! It’s also not hard to pair it with a fancy necklace. The fabric is so soft, I love it. I own every colour ! This is my fave dress and I own it in several colours as well as the v-neck version. You can dress it up with heels or tall boots or with sneakers and a jean jacket. Love that it is versatile and can be worn during any season. Fits big but comfy. Love it. Cober Dress - still fantastic! Love this staple dress - reliable, comfortable and great for travel.